The leader of the Ceylon Workers Congress (CWC), Mr. Arumugam Thondaman, Saturday held discussions with the LTTE's Political Head Mr. S.P. 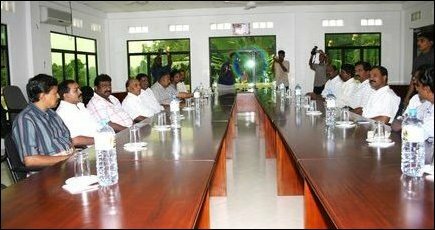 Thamilchelvan at the LTTE Peace Secretariat on his plans to form a united effort among the Upcountry and Western Province Tamil political parties. The Upcountry politician said that his party, CWC and the LTTE discussed the strategic need to form a broad Tamil front to meet the challenges from the Southern polity and to further the common aspirations of both the Tamil communities in the Northeast and the Upcountry. Although the challenges faced by the Tamils in the Northeast and the Upcountry are different in scope, both communities have to face the common challenge posed by Sinhala nationalism, Thondaman told reporters. “Emerging new political formations in the South have created an urgent strategic need for NorthEast and Hillcountry Tamils work together. Such a broad front will be able to confront the rising threat to the security and welfare of Tamil people living in all areas of Sri Lanka, and to resist attempts from the Southern Polity to relegate the status of Tamils to second class citizens,” Thondaman told the press. LTTE's Political Head Mr. S.P. Thamilchelvan was quoted by the LTTE Peace Secretariat website as saying that the meeting was constructive and that the discussions centered around a common strategy that needs to be adopted by the Tamil political leaders in taking forward the Tamil struggle. Deputy Head of LTTE Polticial Wing, S Thangan, Director of LTTE Peace Secretariat, Puleedevan, Thamil Villi from the Peace Secretariat, Naveen from the LTTE Political Wing and Mr Thiagarajah, LTTE’s NGO liason officer attended the meeting with Thamilchelvan. Thondaman was accompanied by CWC senior officials Mutthu Sivalingam, R. Yogarajah, V. Rathakirshnan, M. Satchithananthan, T. Mathiyugarajah, K. Krishnamoorthy, A. Kaneshingh and Mrs. Thevi, sources in Kilinochchi said. “A momentous shift in the history of Tamil political struggle is imminent,” Chandrasekaran said.